Pomegranates have been around for a very, very long time. We’re talking about thousands of years. The inside of a pomegranate has small pink seeds called arils, which are sweet and juicy. 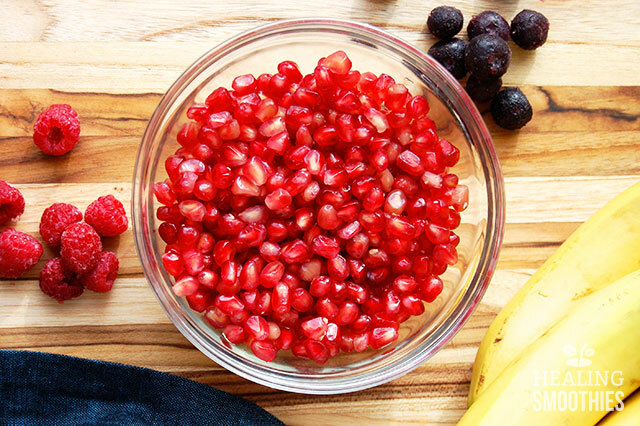 It takes a little bit of work to seed a pomegranate, but the antioxidant-rich fruit deserves a place in your diet. There’s a reason they have been around so long. 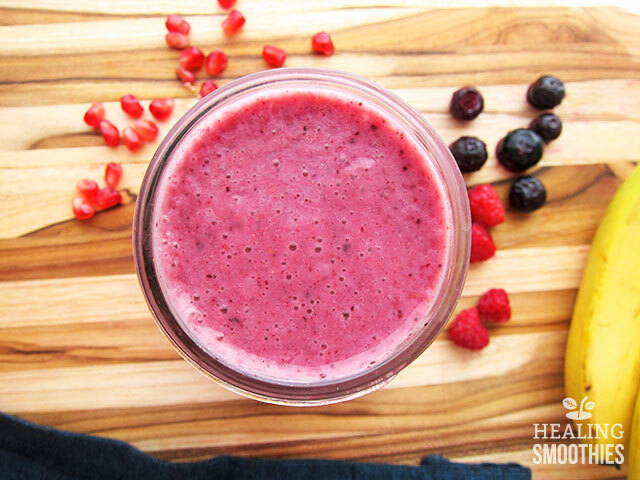 The first step for this smoothie is to juice the pomegranate seeds and strain the juice through a fine mesh sieve or cheesecloth. 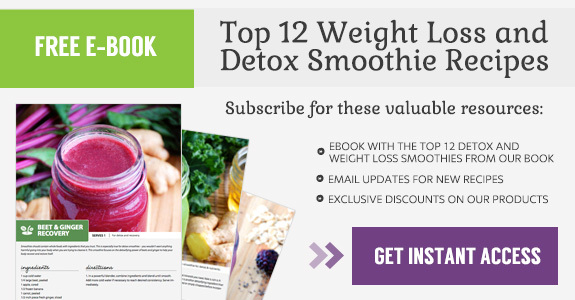 Then you can proceed with making the rest of the smoothie. 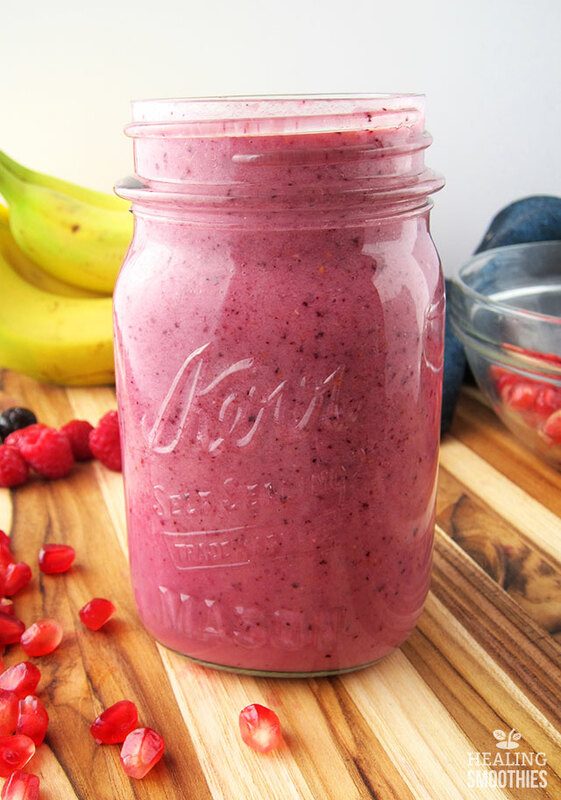 Pomegranates and berries give this smoothie a punch of flavor, while the banana gives it a creamy texture. Pomegranates are an extremely rich source of antioxidants. A poly-phenol that is prevalent in pomegranates, punicalagin, greatly benefits your heart and blood vessels. It reduces cholesterol and blood pressure levels, and improves blood flow in the arteries, helping to keep heart disease at bay. The other poly-phenols found in pomegranates provide your cells with anti-cancer properties, including the prevention of tumor growth. Additionally, the antioxidants in pomegranates may help people who suffer from osteoarthritis. They reduce inflammation and joint pain, and slow down the activity that breaks down cartilage. Pomegranates are also high in the antioxidant vitamin C. Almost half of your daily requirement of the vitamin can be found in one pomegranate. This is especially convenient for people who cannot handle the high acidity content of other citrusy sources of vitamin C.
Along with the amazing health benefits already listed, pomegranates also contain vitamins K and B5, and manganese. Rich in nutrients and antioxidants, pomegranate seeds can be blended into a delicious, fruity smoothie to enjoy as often as you like. 1. Place the pomegranate arils in a powerful blender and puree. Strain in a fine mesh sieve or cheesecloth, and then add the juice back into the blender. Add the remaining ingredients and blend until smooth. Add more milk if necessary to reach desired consistency. Serve immediately.